Changes have come in Warlords of Draenor. Abilities have been dropped and a number changed, though few of the changes are “Frost Only.” You have also lost your Ghoul, Death Coil, and a few other things. See our Death Knight in Warlords post for a full list of all of the Death Knight changes. One thing that hasn’t changed is your ability to lay down a lot of damage. This Frost Death Knight guide is primarily intended for use at level 110. However, the principals will still apply during the leveling process. If you’re looking for advice on leveling your Death Knight, check out our Death Knight Leveling Guide. If you want the same in-game step by step leveling guide that we use to get to level 110 as fast as possible, take a look at our favorite in-game leveling guide. In Legion your talents can easily be changed IF you’re in a “rested XP” area, such as your garrison, an inn, or the big city. No reagents, trainers, or special rituals required. You can change your spec (go Frost or Unholy) any time you’re out of combat, but for the individual talents you need to get to the rested area. As with changing specs, no special items are required for changed talents. So if you want to DPS one fight and then you need to tank the next one, or try unholy because it looks like a bitter fit, then switching is easy. If one suggested talent doesn’t work for your style, change it up. Note that Death Strike now costs Runic Power in Legion, not the runes that it used to cost. Our general picks are checked, , but do keep in mind that you might want to change now and then. Glyph of Cracked Ice and Glyph of Dry Ice modify your Path of Frost appearance. Glyph of the Chilled Shell and Glyph of the Crimson Shell modify your Anti-Magic Shell appearance. Glyph of the Blood Wraith, Glyph of the Unholy Wraith, and Glyph of the Wraith Walker all modify your Wraith Walk appearance. Glyph of the Geist and Glyph of the Skeleton modify your ghoul’s (if you switch to Unholy) appearance. Nothing like a frostier looking Anti-Magic shell and Wraith Walk to improve your damage, right? In Warlords you will learn a number of glyphs automatically, just as you do with your abilities. You will still need to install them as with all the others. You can get the remaining glyphs in the usual way. Note that various glyphs are exclusive with similar glyphs. This means that you can only use one or the other of them, not both. For example, you can use only one of these glyphs at a time: Regenerative Magic, Anti-Magic shell, and Absorb Magic. Glyph of Regenerative Magic will give you more Anti-Magic shells over time. Glyph of Anti-Magic Shell increases the absorption effect of your shield to 100% instead of 75%, although it still absorbs the same amount of total damage. Glyph of Swift Death – because any movement speed increase is nice. Glyph of Pestilence – Makes it easier to spread your diseases around by giving Pestilence a 15 yrd radius. Glyph of Icy Touch – Dispels a helpful effect from the target, which has occasional use. Glyph of Dark Simulacrum – Your DS absorbs some harmful spells and the glyph increases the duration and reduces the cooldown. Doesn’t work against most boss spells. It’ll be a DPS increase if there effects that it does work against. Glyph of Icebound Fortitude – More, and much shorter, IFs. Useful if the boss will be tossing several brief, high damage effects your way over the course of the fight. Glyph of Death and Decay – some use for kiting mobs since D and D will now slow them. Most of the minor glyphs are pretty much just for fun, though the first two (that modify threat) are pretty important. Glyph of Tranquil Grip removes the taunt effect from your Death Grip, a very useful glyph in the event that you need to use Death Grip on an encounter as it avoids disrupting the tanks control of a mob while still allowing you to maneuver it with Death Grip. Glyph of Army of the Dead – You don’t really want your ghoulies taunting things, do you? This removes that ability from them. Warlords has slain Hit, Expertise, resilience, PvP Power, and Reforging. It’s added a couple of stats that you can gem and enchant for (Multistrike and Versatility) and a couple of others which will randomly appear on some gear or effects, such as Leech. Legion does away with Multistrike, and Bonus armor, and “Attuned” stats. You can also only dual wield one-handed weapons. You also have an attuned stat, haste, which is granted with your Icy Talons ability. This gives you 5% more Haste from all sources. The exact values of Mastery, etc., will vary with gear. Strength improves all of your damage, including your diseases. Mastery favors dual wield, since you will be doing more “frost damage” strikes. Frost damage makes up a solid chunk of your overall damage. 2h weapons favor Obliterate, so Mastery has less value. Multistrike causes your abilities to have a chance to add one or two additional hits/heals, each at 30% of the original. You get no special additional damage from these strikes, unlike Unholy. Versatility adds to your damage, your heals, and your damage reduction. Haste gives you faster rune regen and more Killing Machine procs, but it’s still a bit below the others in value. Crit -With your Killing Machine procs you have little need of crit. Dual-Wield (DW) and Two-Handed (2H) Frost have slightly different priorities which I will detail below. Given equivalent weapons, DW and 2H are about the same for single target, while DW is better at A of E and cleaves. 2H has stronger Obliterates, solid single target damage, and is a bit easier to use. Presences are gone in Legion and so is your ability to use two-handed weapons. You are now dual-wielding one-handers. Death strike now uses Runic power. Frost Fever is now your only disease and it has a chance to restore some Runic Power. It can only be applied with Howling Blast. Rune of the Fallen Crusader procs add to all damage done, including diseases, if they’re applied during the proc. If you use it on both weapons the procs do not stack, rather the duration of the proc is extended. The boost to disease damage will fall off when the Fallen Crusader buff does and they will take on any new buffs that you have, again just for the duration of that buff. Rune of Razorice for the off-hand weapon. Pillar of Frost adds 20% to your Str and should be used as it’s available, stacking it with other procs and buffs, if possible. Empower Rune Weapon on cooldown, but only when your runes are depleted and Runic Power is low. Keep diseases up at all times. Cast your “go to” strike, preferably on a Killing Machine proc. Keep an eye on your runes. Try not to have full runes just sitting there, doing nothing. Also try not to go to zero runes. As above, applying diseases is your first priority. Keep your diseases applied at all times, this means making certain that Frost Fever and Blood Plague are present on your target. Use Frost Strike at max Runic Power or whenever Killing Machine procs. Use Death Strike if you need some healing, otherwise your Runic Power is better spent on Frost Strike. Howling Blast should be used whenever Rime procs. It also refreshes Frost Fever. Use your Runes on Obliterate when Frost Strike is not available/optimal. Howling Blast without the proc., using Death and Frost Runes. Leave enough runes for Obliterate. Short on gold? “Perfect” gems have the same stats as the “regular” gems and one or the other might be available for a much lower cost. Baring that you can always check our Gold Guide for tips. Gem sockets have a (small) random chance to appear on Raid and other gear, they are not as common as before. There are no meta gems or meta sockets, there are no socket bonuses, and all sockets are “prismatic,” which means that they will take any available gem. The gems themselves are actually available. They are all prismatic, meaning they fit into any socket. None have Int, they all have secondary stats (Mastery, etc.) Apparently there are no Meta sockets or gems. Older (Mists of Pandaria) gems work until item level 600, but the item squish cut them down a bit. What used to be 160 Int is now 10, for example. The new Prismatic gems are 50 points of Mastery or whatever. Older gems (Mists of Pandaria and lower) that used to code for Hit now do Crit, gems that had Expertise are now Haste. Dual Wielding? Gem for Mastery. Two Handed? Gem for Haste. Mists of Pandaria Gems, for gear under ilevel 600. Cogwheel Requires an engie helm, such as this. Get Strength where you can, then your next best stat (Mastery or Haste) when you can’t get Str. Short on gold? While some enchants are pretty cheap, some of the others aren’t. At least you don’t have to worry about buying weapon enchants at 1-2k gold each. If you want to buy the best enchants, fund all of your alts, donate to the guild, etc., but don’t have the cash, then see what the Tycoon Addon can do about about fixing your cash flow. In Warlords of Draenor the enchants are more available than the gems, but there are limits. The only items that you can enchant on WoD are your weapons, rings, neck, and cloak items. There are not primary stat enchants, only secondary stats (Mastery, etc.) There is, however a weapon enchant which will bleed your opponent. Off-Hand: Rune of Razorice – more Frost damage. Note: There is a “Glory of” version of each of these enchants which looks just the same as the above, so they are not included here. Note: There is a “breath of” version of each of these enchants with +30 Stats, instead of +50. Note: There is a “breath of” version of each of these enchants which have the same stats, but without the 10% movement bonus, and which is probably cheaper. Other enchants, for gear under item level 600. Belt Livingsteel Belt Buckle: Sockets your belt, pop in the best gem. Boots Enchant Boots – Pandaren’s Step: +10 Mastery and Slight run speed increase. Note that Pandarens get twice the food buff. All food buffs last one hour and provide only one stat. There should by more interesting foods in Legion. Savage Feast: feeds 30, 100 in Highest secondary stat, this is produced by your barn’s work orders, not Cooking. Draenic Swiftness Potion: +70% movement or +200% swim speed for 8 seconds. Elixirs – you can have one battle and one guardian elixir up at a time, but none are interesting at this time. Stout Augment Rune: +50 Str for one hour. Occasionally drops from WoD bosses (in Raid Finder mode) and is also rarely found as mission rewards from your Garrison. Stacks with flasks and other buffs. Oralius’ Whispering Crystal: +100 to all stats. In Warlords the profession bonuses are dead, However leveling professions is easier and generally cheaper than before. Once you get into Draenor you will, fairly early on, get a scroll for each of your secondary professions which will raise your cap to 700. For your crafts you will get a quest that will award you with a similar scroll and a number of recipes. One of these will be a “secrets of…” recipe. Use that to generate materials to trade for new recipes, either at your Garrison or in Ashran. Why get a profession since there are no bonuses? For the item level 640 gear that you will, eventually, be able to create. That gear requires level 91 to equip. Said gear require a lot of materials to create, your Garrison will be a help here if you create a professional building. If you’re below 90 then you’ll have to do it (level your skill) the old fashioned way. See our professions page for more info on leveling up the various skills. Several professions have definite value while leveling, others not so much. If gear is readily available on the Auction House, and you have the gold, then the professions are less important. Sometimes making your gear is the only way to go. Or hoping you win the rolls in the dungeons. If you just want something to earn gold with, then the gathering professions are the most reliable choice. You can make plenty of gold with some of the crafting professions (Inscription and blackmithing have worked very well for me,) but it takes some work to find the sweet spots. Gathering isn’t quite the gold maker that it used to be, thanks to the Garrisons, but if you leave Draenor and gather some of the older ores, skins, or herbs you’ll make more gold than with the Draenor bits. Note that all of the craftable gear pieces can be bought on the Auction House. Blacksmithing allows you to make some nice plate gear and weapons, including starting raid gear in Warlords. Alchemy better living through chemistry. Drink up and get heals, improved stats, etc. Engineering makes a lot of useful gadgets, especially once you’re 90+ (and have Draenor Engineering.) Rockets, gliders, and shields all have use in the open world, but they’re not allowed in raids. Inscription will let you make a very nice shoulder enchant, makes shoulder enchants for others, make all your own glyphs (and for your pals,) and make a few other items. Enchanting lets you do everyone’s enchants, plus those rings and neck items. Jewelcrafting creates useful rings, neck items, gems (of course,) and gemmed mounts. Tailoring and Leatherworking are pretty useless for you. The gathering skills are nice for making gold or supplying the appropriate profession. If you have lots of gold: Blacksmithing & Engineering for the useful gear and toys. Otherwise: take two gathering skills and level the profession skills later. Pandarens cannot be Death Nights. None of the racials are very important to DPS ability save perhaps the Orc’s Blood Fury. In Warlords all of your racials that were for Hit or Expertise have been slain. Some new racials have been added. All races can now offer something that adds to total damage. Worgen – 1% extra crit, sprint ability is quite nice every two minutes. Draenei – Heal over time, bonus to Str. Dwarf – Stoneskin sheds some effects and reduces damage, +2% critical effect on damage and heals. Gnome – 5% more Runic Power, an escape from snares will have occasional use. Night Elf – 2% extra dodge is an Ok ability, but is more for tanking. Shadowmeld has some very situational use, such as when the tank loses aggro. 2% faster run speed and +1% Crit, by day, which becomes +1% Haste, by night. Goblin – Rocket Jump can be a useful movement ability, 1% Haste is a decent stat, esp for 2Hand Frost. Troll – Increased attack speed as a cooldown. Undead – Wash away fear, sleep, charm; drain life and restore some health from it. Tauren – Increased Stam, War Stomp stuns close opponents, +2% critical effect on damage and heals. Blood Elf – Arcane Torrent silences casters and restores some Runic Power, +1% Crit. Death grip your mouseover target. Useful for wandering targets. “Time to Die” macro – ties all your buffs together. /use 14 uses your “on use” trinket, if you have one and you have it in the second trinket slot (slot 14.) If it’s the first one use ’13.’ Test this on a target dummy so that you know exactly how it works. Try to line this macro up with a Fallen Crusader proc. Death Knight leveling is easy, maybe too easy, especially when you have some nice gear. Blood is very tough and does decent damage, Frost and Unholy do tons of damage to make up for any lack of toughness. Still, it’s a long way to 110 and there are thousands of quests and a bazillion mobs to kill (not to mention other players, but they don’t count here.) Sorting out which quests are best and which series of quests will get you to 110 the fastest is another game entirely, which is why we highly recommend Zygor’s Guide. 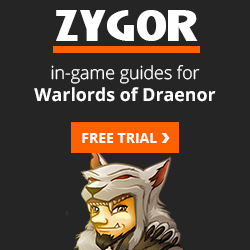 Zygor’s is an in-game guide and it transforms the whole leveling process: you just pick your starting point, at any level, and the guide tracks which quest you’re on, tracks the quest objectives, and automatically advances and updates as you complete your tasks and quests. In addition, a waypoint arrow is set automatically, so you never have to wonder where to go. All the way to 110 you will never wonder what to do next or where to go. Playing with Heirlooms and/or Recruit a friend? Gaining a few levels in the dungeons or in PvP? Zygor has your back. The guide knows what level you are and will correctly suggest where to go next. It will even help you to dump all of your obsolete quests. Better yet, you will probably never need to look at your quest log again. Grab your copy here or read our review, first. Like this page? How about recommending it? hello i have dk dual with heroic axe 657 ilvl and my dps in hm normal is @15k … i do rotation stats enchants right why is the reason ? See what I mean? I’d work on the target dummies and in he proving grounds and experiment with different things. I’m assuming that you’re far from being a noob, since you have those axes, but people can also be smoother with their abilities and better with their reactions. You might also want to grab another Frost DK and work those dummies together and give each other feedback. Use Recount and see if some of your damage is coming from the wrong place. Great guide, my main is Blood/Frost DK. Only have one question, Roiling Blood spreads you diseases to all adds within range plus damage. I have tried unholy blight but wouldn’t Rolling Blood be better? Pestilence has a very short range, unless glyphed. Unholy blight makes sure everything in the area is infected, without glyphs or any other abilities. It makes it much easier to keep your diseases up on the whole group, all the time. You’ll also note that Blood Boil in not part of the listed rotation, for Frost DKs. Thank you very much. I’m a better dk thanks to you! Very good, learned a lot i had no idea about, if you have not checked this out then your not getting the best out of your DK. It is a really good guide! I reccomend it 2 other frost DK’s.